The web site below has lots of information on why marriage is so important as well as ideas on how to strengthen your marriage. Take the time over the next few days to educate yourself on the benefits of marriage and ways you can ensure yours lasts a lifetime. We have included a marriage tip that we believe all can do for 7 days. 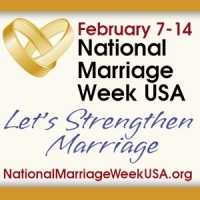 Happy Marriage Week! Be intentionally positive! Why not try this? Every day for the next seven days, find one thing you love and appreciate about your spouse. Then sometime during the day let your spouse know this. Random words if kindness, appreciation, and positivity go a long way towards filling up the love-bank!